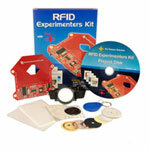 Take a look at the RFID Experimenters Kit which comes with 5 projects and a variety of sample tags. Need to go wireless? We have got you covered with the Wireless Upgrade Kit. 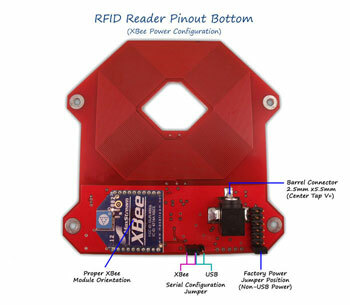 The RedBee RFID reader has a direct USB and wireless XBee serial interfaces, selected via jumpers. The USB interface simply connects to a host computer using a USB A to Mini-B cable (included with the RedBee RFID Reader). The XBee wireless serial interface communicates with another XBee module connected to the host computer via a USB Xbee carrier board. NOTICE: The RedBee does not come with Xbee. 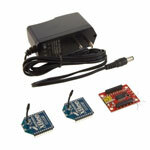 The Xbee Modules must be purchased seperately. 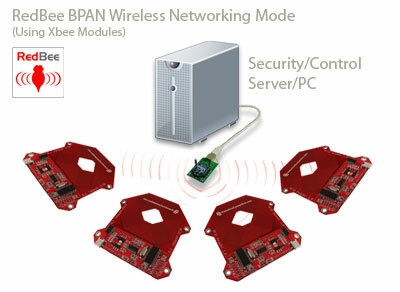 The XBee wireless interface is very powerful in that a single host computer can communicate with one or more RedBee readers, simultaneously, using the Networked BPAN mode. This requires some basic XBee configuration of the RedBee RFID reader and XBee modules, but is very easy to do. Setup will take a matter of minutes. A configuration How-To of the RFID readers to communicate in a Networked BPAN scenario is available below. The RedBee RFID Reader has an excellent range of 4 ½”, however, this can vary depending on the RFID tag packaging, input voltage, and orientation of the tag when swiped. 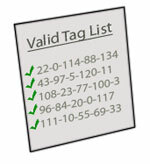 The RedBee RFID reader can store up to 48 tags in an internal valid tags list. Tags can be saved/deleted to/from the list either via serial commands, or by toggling the SAVE and/or DEL pins on the reader. 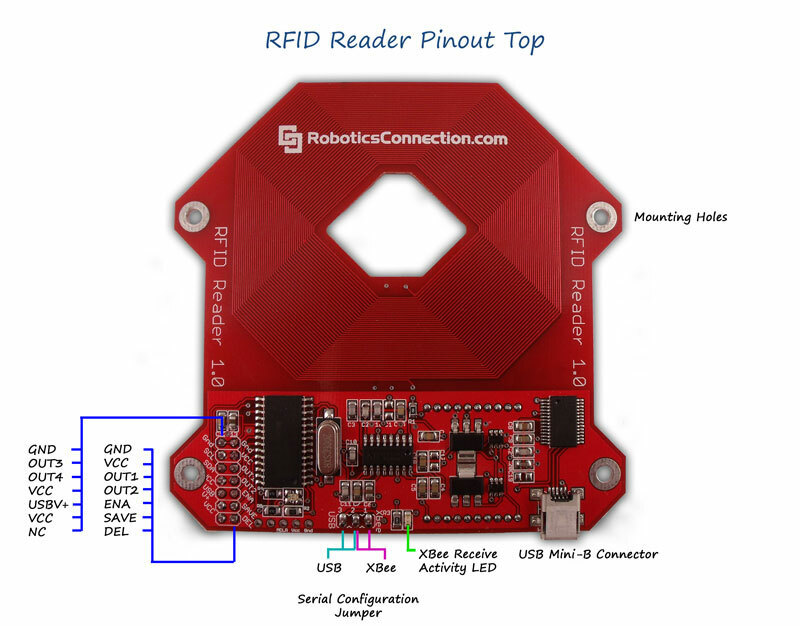 In response to a tag swipe, the RedBee RFID reader can respond by automatically pulsing one of the four OUT pins. This ‘autopulse’ functionality allows you to connect up to four relays (for example) to the OUT pins, to activate door locks or other peripherals when a valid tag is swiped. [Independently configure Autopulse parameters for all 4 GPIO lines] Setting the direction, duration, and enabling of each autopulse pin is fully configurable via serial commands. The RedBee RFID reader transmits out serial event packets in response to various events, containing data specific to that event and RFID tag id. This allows the host application can decide on the appropriate action to take (e.g. grant access for the tag id swiped), and send a command down to toggle one of the outputs (e.g. to unlock a door). This is useful to keep the configuration on the board coherent with host applications that are also communicating with the reader. 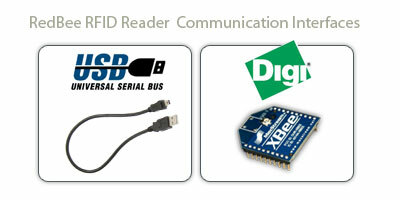 NOTE: Make sure you have the latest RedBee RFID .NET Library installed. This application allows you to test the the most commonly used functionality of the RedBee RFID Reader. This application allows you to see what RedBee RFID reader devices are talking on the XBee Broadcast Personal Area Network (BPAN) using SSDP. It also displays asynchronous RFID readers event information flowing across the BPAN. 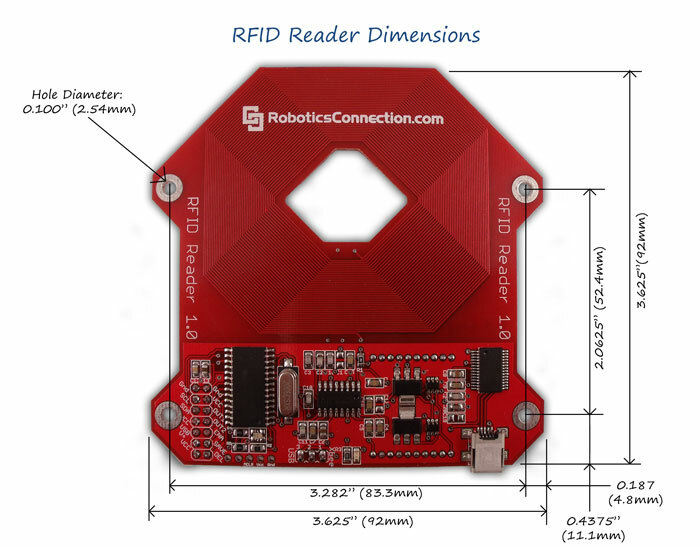 We would like to thank RFID enthusiast Amal Graafstra for his contributions to the development of this reader. His beta testing and valuable input helped make this product the best it could be! Thanks Amal! † NOTICE: Stresses above those listed under "Absolute Maximum Ratings" may cause permanent damage to the device. This is a stress rating only and functional operation of the device at those or any other conditions above those indicated in the operation listings of this specification is not implied. Exposure to maximum rating conditions for extended periods may affect device reliability. Looking for a power supply? You can find the matching power supply with 2.1mm jack here. Looking for an enclosure? 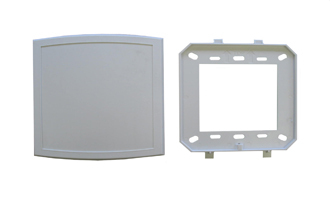 The RedBee Wall Plate works great!